Damascus bomb blasts over the weekend have been followed by firefight between the rebel Free Syria Army and the forces of President Bashar al-Assad. Witnesses say the sound of machine-guns and rocket-propelled grenades can be heard from the district of al-Mezze. The central neighborhood hosts several security facilities and is one of the most heavily guarded areas. The UN estimates more than 8,000 people have now died in a year-long uprising against President Bashar al-Assad. Al-Mezze has previously been the scene of large anti-government protests. One resident told Reuters news agency that there was “fighting near Hamada supermarket and the sound of explosions there and elsewhere in the neighborhood”. Opposition activist Amer al-Sadeq said he had spoken to a contact in al-Mezze who reported four blasts within five minutes and then heavy gunfire. Al-Mezze is an upmarket residential area but has a substantial security presence. Close by is the Mezze 86 district, a security stronghold, whose residents are loyal to President Assad. Early last month, residents of 86 district fired at protesters who took to the streets calling for an end of President Assad’s rule. In January the Free Syria Army briefly seized several Damascus suburbs. The latest incident follows bomb blasts in Damascus and the northern city of Aleppo over the weekend. 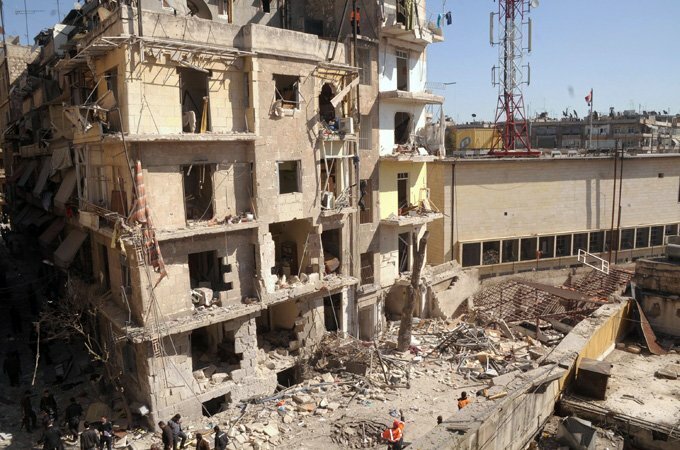 The car bomb that exploded in Aleppo on Sunday killed at least two people and injured 30 others. A day earlier, at least 27 people were reported to have been killed and 97 wounded in two explosions in the capital. State TV described the blasts as “terrorist” attacks. However, activists have accused the authorities of staging incidents to discredit opposition groups. As diplomatic efforts to end the crisis continue, the head of the International Committee of the Red Cross (ICRC), Jakob Kellenberger, has travelled to Moscow to meet Foreign Minister Sergei Lavrov and ask the Russian government to press Syria to allow more humanitarian access. The ICRC says that, in the worst-hit areas, a daily pause in the fighting of at least two hours was needed for the evacuation of the wounded and to allow in food and medicine. Russia is a key ally of Syria and, along with China, has thwarted attempts to form a UN resolution condemning the repression. Sergei Lavrov is likely to say that while Russia is engaging with Syria, it cannot tell the government there what to do. There is some frustration in Moscow with the speed at which Damascus is responding to some initiatives, particularly that of UN and Arab League special envoy Kofi Annan. In another development, the UK-based Syrian Observatory for Human Rights said security forces beat and arrested senior opposition figure Mohammed Sayyed Rassas on Sunday. Mohammed Sayyed Rassas, a leader of the National Co-ordinating Body for Democratic Change (NCB), had been taking part in a protest march in Damascus, the group said. President Bashar al-Assad is trying to quell an increasingly armed rebellion that sprang from a fierce crackdown on peaceful pro-democracy protests a year ago. He insists his troops are fighting “armed gangs” seeking to destabilize Syria.